Farnham will be getting festive on Saturday (17 November) when the town’s official Christmas lights are switched on by the Mayor of Farnham, Councillor David Attfield. The afternoon of family fun will begin at 1pm at Gostrey Meadow. Thanks to support from Gold sponsor Personnel Selection, Farnham Town Council has been able to arrange for a live nativity, free Santa’s Grotto, horse drawn sleigh rides and entertainment from local schools and youth groups. There will also be festive stalls, food and drink stands and children’s rides throughout the afternoon. Cllr Jill Hargreaves, Lead Member for Tourism and Events at Farnham Town Council says: “Christmas can creep up on us so with just over a month to go and only seven Saturdays before the big day, now is the perfect time to come into town to start shopping for gifts, decorations, food and drink, and perhaps even your New Year’s Eve outfit or Christmas jumper. The Mayor of Farnham will switch on the lights at 4.30pm after a reading of ‘Twas the Night Before Christmas by the town crier. After the switch-on, Churches Together will stage a 30-minute Christmas programme that will include carol singing by the Community choir, spoken word on the theme of Christmas and live music. Farnham Town Council’s Christmas lights switch-on is also supported by bronze sponsor BBS for Magimix. 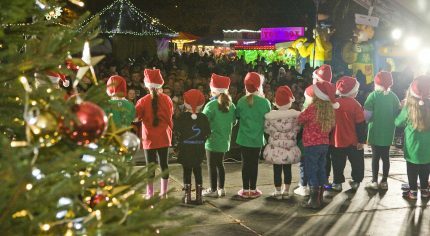 It marks the start of several weeks of festive activity including the Christmas Market on 9 December, the Farnham in Bloom Winter Celebration and the Mayor’s Civic Christmas Carol Service. The Christmas in Farnham programme of events is made possible by sponsorship from principal sponsor The Patio Blackspot Removal Company. See full details about Christmas in Farnham events.